Well, after 5 days of watching it snow, waiting and watching avalanches run and after 3 days of working on the icefall the team finally got back to Camp 1 today. The photos I am sending will show you what we found. 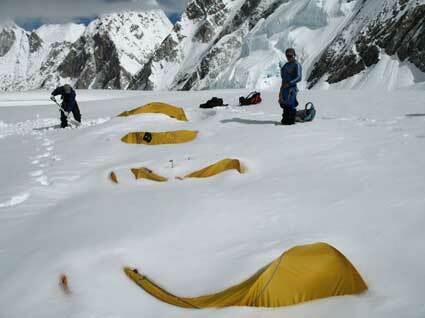 Cami Sherpa took these photos of our VE-25 tents almost completely buried in the snow. They are strong tents though, we dug them out and they were perfectly intact when the weight of the snow came off them they rebounded perfectly. 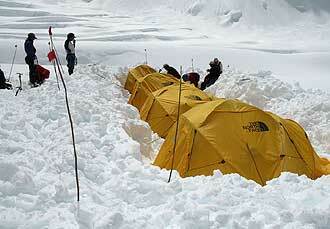 Of course it was a lot of hard work for the Sherpas to dig the tents out and get Camp 1 reestablished. We are planning to go up tomorrow back up to Camp 1 and the Western Cwm and we have big plans this time. On this particular rotation we’ll go up high, continue to acclimatize sleeping at those higher elevations. We plan to do a lot of work with getting more familiar with the Western Cwm back up to Camp 2 and above and even the Lhotse face. So please stay tuned as the team continues to push higher. It was a big storm but just a normal set back for us. We still have a good life here at base camp and we feel really strong about the quality of our Sherpa team and their dedication and certainly the qualifications of the seven climbing members of this Berg Adventures Everest team. We got a ways to go yet but we have had a great start so far, a great base of acclimatization conditioning behind us and here we go back up the mountain tomorrow on the 30th. We’ll keep you posted as we move up.